Dying alone in space doesn’t seem so bad now that I’ve played Out There ($3.99) from Mi Clos Studio. I’ve exploded a few times, been stranded without fuel a few dozen and suffocated on at least one occasion. On the way, though… On the way I discovered the mysteries of the universe. Out There might look a bit like, say, FTL in the right light, but it’s a different breed of game. It’s about desperately managing resources, making careful choices and suffering their consequences. It’s about exploration and being terribly, terribly alone. It’s not at all about space combat, and that’s entirely okay. Its premise sees you lost in space with a little ship and a heck of a long trip home. You’ve gone off path under cryogenic sleep, and you’re nowhere near Earth. You have the technology to jump between solar systems, though. With that, you begin a mission to get home. That mission shakes out differently every time you play. At its base, Out There is all about resource and risk management. 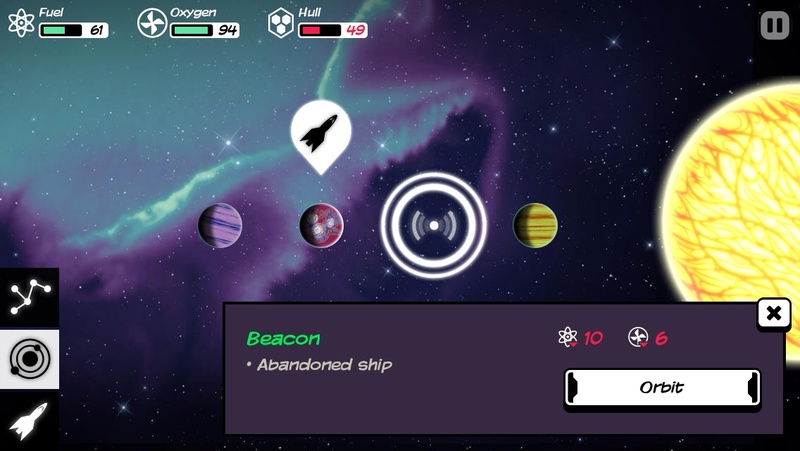 You can exploit the planets you find for their resources, and those resources give you fuel, oxygen and hull strength. Run out of any of those three things and it’s game over. You tap your way through solar systems, and on and off of identical planets. 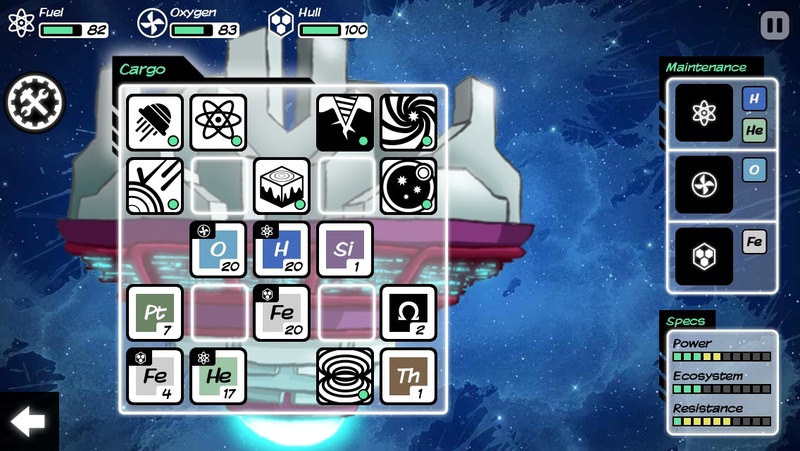 You drag elements around to fuel your ship and destroy anything that takes up precious space but doesn’t pull its weight. While you’re getting the hang of it, your decisions revolve around which resources to risk to get others. Each time you eke out a profit in hydrogen or iron you drag out your survival a little longer. You score a little higher on the leaderboard, maybe finding your way to a clever achievement or two en route. But Out There’s galaxy is procedurally generated, so mastery isn’t guaranteed. You’re rarely far from an unlucky death in space. 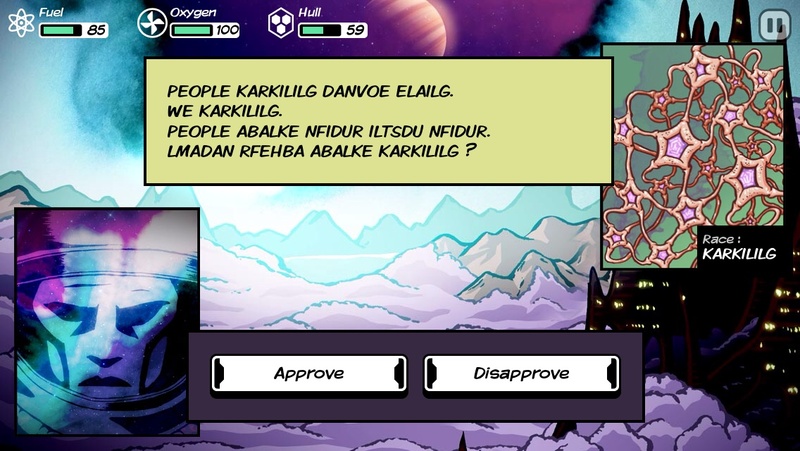 This isn’t the sort of game you’ll finish in one try—it has a bit of roguelike in its blood. The galaxy opens up when your skill and luck take you beyond those basic elements of survival. The game starts to introduce you to bigger ideas. Gamebook-style choices mix in nicely with musings on your place in the universe, though both occasionally suffer from poor editing. They’re part of the narrative at play, one that only really starts to show itself deep into the game. I’ve seen it in bits and pieces during my many expeditions, and it’s driven me to keep trying when my failures might otherwise grind me down. Not only do your big goals branch in dangerous directions as you progress—you also slowly pick up the language. This lets you communicate with the locals, and it also gives you a chance to understand the mysteries you stumble on. They are many, and they hint at bigger things. If you want to live long enough to explore those bigger things, you need tech. The ship you start with is beat up. It can’t hold much, and it can do even less. One of the few frustrations of Out There is that your shot at eventual success is almost entirely tied to randomly finding a ship worth flying. On the chance you do find something to take you the distance, you’d better hope to find the right gear. Without both those things you’ll eventually find yourself unable to move forward. It’s not enough to know the best technology to build, or where to find the elements to build it. You also need to be very, very lucky. The constant fear of death and failure certainly adds to the game’s melancholic atmosphere, but those deaths can sometimes seem brutally unfair. It still works, that unfairness, because the odds should be stacked high against you. They should tower above you at impossible distances. You’re a single individual, alone and friendless in a vast universe. To think you might make it home is sheer arrogance, and of course random chance will obliterate you nearly every time. It works because Out There gets the threat of death right. I can’t count the times I’ve weighed the risk of stopping at a gas giant, wondering if this will be the one that flares and takes out my hull and if I’ll even be able to gather enough fuel to make it worth while. I’ve jumped from system to system, praying that the next will have an inhabited planet where I can refill my oxygen tanks. Sometimes nothing seems to work in your favor. Sometimes the game reaches out and snatches away your hopes with a single unlucky encounter. But sometimes, just sometimes, your wishes come true. You might not reach the end, but those times when you come tantalizingly close to success make it all feel worthwhile.